Considering purchasing the Pioneer DM-40 White Active Monitors? Have questions? Ask people who've recently bought one. Could i hook a subwoofer up to these? 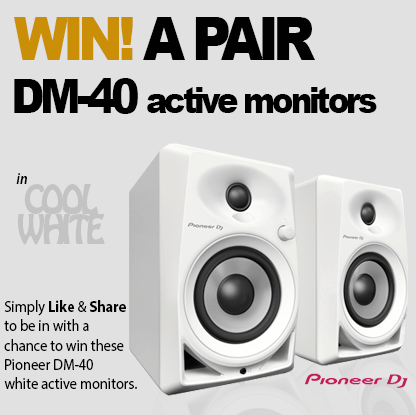 Do you own the Pioneer DM-40 White Active Monitors? Why not write a review based on your experience with it. Great sound louder then expected!! Great sound and delivered on time . Perfect monitors for anyone looking for something reasonably priced or just something to start with. Their a great size to fit in every bedroom/studio and still provide a brilliant, loud sound quality. They also come with and extra aux port to connect to any other speaker you my already own and a headphone port for when you need to be quiet. I would highly recommend this product to anyone! Brilliant little speakers for the price there all u need and more for a bedroom setup or a little studio etc Easy to move around if one wants to take them in the garden or something like that overall deffo impressed. These make playing vinyl even more fun now. For the money these speakers are amazing. Great sound quality, good build quality(they feel solid) and they look good too! For Â£130 they are an absolute bargain! Got these for my dj studio and wow! great sound and look mint!!! everyone who comes in says these are fantastic!!! 100% recommend! LOVE IT!!! its pioneer too so obvs they build well. Good bass on them also! Big clear sound from a small set of monitors! I use these connected to my Z2 and is amazing, look great and I love how they power off when not in use, no switching on/off buttons! I love these speakers, they make a great sound, perhaps they could be louder but they are still great. I think these are excellent, Iâ€™ve got them for home use and will never see their full potential. Great bit of kit. Ive had these for just over a month, and honistly there rubbish! After i think it was 22nd day i had them, they started popping, crackling, and sometimes wouldnt even play, i also didnt like the delay on when you turn them on...can happily say there in my cupboard out the way. I wish i didnt spend the money on these and wait to buy better ones. Seen a video for Pioneer DM-40 White Active Monitors online or have you own video? Check out Pioneer DM-40 White Active Monitors on DJkit.com! Single item With RCA to RCA Cable FREE!